Walrus has beautiful spiraled tusks and can catch and eat clams with ease. Raven must search through the mud to find clams not being willing to try becoming a walrus for fear of embarrassing herself. But her envy turns to rage when Walrus notices her efforts one day and makes fun of her. Calling out to the Strength of the Land, Raven turns the surface of the ocean to ice trapping Walrus inside. Raven encourages other creatures to join her in tormenting Walrus who can no longer search for clams. When Walrus can't take the torment any more he in turn calls on the Strength of the Land to aide him in making his escape. This Inuit folktale not only highlights the beauty of the Arctic environment but the power of the land. This is also a pourquoit tale that highlights how walrus's tusks turned out the way they did. Like most folktales this story has a clear theme: the dangers of misusing power as well as the dangers of envy and rage. The transformation of walrus is a rather drastic one which the illustrations clearly show. I'm always looking for folktales to share with my students and this one is definitely going on the list. My favorite part of this book though is the beautiful illustrations which I fell in love with immediately. Arnaq, a beautiful young Inuit woman loves her life and doesn't think that any of those who seek her hand in marriage can offer her what she wants, which is to avoid a life of hard work. When a fulmar (bird) shaman named Qaqulluk shows up and promises her the world she agrees to marry him. But when she accompanies him home she discovers that nothing he told her is true. She is left to live in a hut of holey fish skins, eating fish for every meal. Eventually, her ataata (father) comes to check on her and is enraged when he discovers her unhappiness. The two leave together, followed by Qaqulluk and his fulmars. At first Arnaq's father defends her but when the fulmars raise a big storm he tosses her over the side to save himself. When he cuts off her fingers to force her to release the side of the boat, her fingers turn into whales and seals. 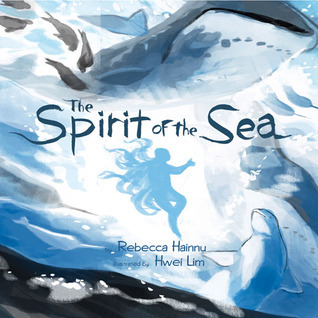 She ends up at the bottom of the sea where she becomes Nuliajuq, the spirit of the sea. Sea mammals are said to obey her because they were once a part of her. As the spirit of the sea, she avenges mistreatment of the sea mammals and punished the fulmars for their deception. This Inuit folktale tells a story of pride, deception, and cowardice and the tragic consequences. The beautiful blues, whites, and browns highlight the Arctic world in gorgeous spreads. I appreciated the pronunciation guide at the end and the explanation of the names used in the story. 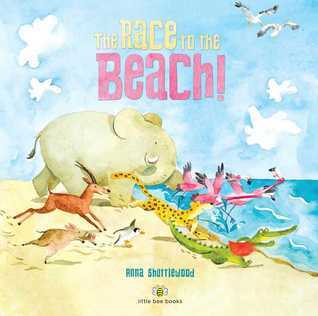 The animals at the zoo take off for the beach for a nice summer holiday. After boarding the train and enjoying various individual activities at the beach the animals start to get bored. When seal proposes a race the other animals all agree, except for Giraffe. The animals speculate about why Giraffe won't join the race. The winner is to be the one who swims the farthest out into the ocean. But when Crocodile starts calling for help, Giraffe can't just sit by. I found the story quite fun with the bright, colorful illustrations. I especially liked the fact that the text refers to specific things going on in the illustrations, I couldn't help looking at the pictures to find the referred to activities. The overall feel of the story is upbeat and the message not at all heavy handed. Recommended. 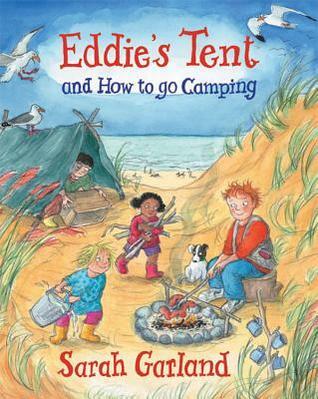 Eddie along with his Mum, Tom, Lily, and Tilly go camping at the beach. After setting up their campsite, they go to bed. The next day is spent preparing food, enjoying the beach, and visiting the nearby town. Eddie even takes time to build his own tent. After visiting the nearby town and meeting a boy named Max and his puppy, Eddie and his family head back to their campsite. Max and his grandfather come after them to get their help searching for Max's missing puppy. It takes a rare talent to write a book that balances out the information the author wants to share but keep the focus on the characters. Sarah Garland has done a nice job here mixing the camping details into the story. It was fun to see Eddie and his family go camping. The book has a definite British flavor using British terms and camping activities. There were some ideas that I'd even like to try the next time I go camping. Reading about the food cooked over the fire made me hungry. There isn't anything else quite as tasty as a campfire cooked meal. The ideas mentioned in the book are more thoroughly explained at the end of the story. Thoroughly enjoyable for camping fans. Tremendous battles, dangerous operations, fearless spies, and legendary heroes from America's deadliest conflict! I have some mixed feelings about this book. On the one hand it has tremendous young reader appeal but on the other hand there were a few statements that I felt were misleading though not technically wrong. On the one hand the list of resources the author read and used at the end was tremendous, some specific references on certain information would have been nice. And while I enjoyed the author's rather snarky, sarcastic tone, I wonder if all children will pick up on it, especially the references to things that did not exist during the Civil War, which could easily confuse some child readers. That tone also seemed to make light of the seriousness of battle. The author has done a nice job of choosing topics and events that carry a lot of interest. I found myself compelled to keep reading to find out what else the author had to say. I even learned some things, which for a Civil War reader like myself says a lot. The numerous sidebars provide information about topics related to each chapter giving additional information and background. For each major battle, statistics related to the number of soldiers involved and the casualties inflicted as well as who is considered to have 'won' the battle are included. While I didn't read anything that was technically incorrect (at least as far as I know) there were several places (at least three that I counted) where things were phrased in such a way as to be misleading. For example, on page 55 the author says, "On November 7, 1917, Communist supporters of Vladimir Lenin stormed the palace of Tsar Nicholas II, killing the Russian emperor and his entire family and beginning a civil war that would spread across the country." While technically that is correct, the Russian emperor and his family were at the SUMMER PALACE when the revolution first began, and while they were killed it wasn't until months later. So, technically correct but misleading. A reference to 'Mormon separatists' on page 41 is also misleading in that the Mormons moved to what later became the state of Utah in order to avoid ongoing religious persecution and not to establish a separate country makes this misleading. 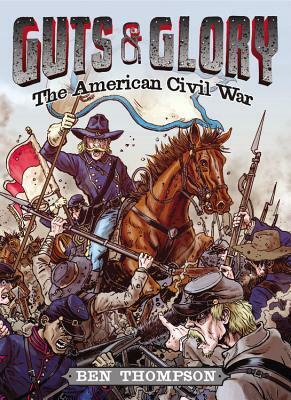 The illustrations add a nice touch but like most illustrations of battles they involve a good deal of supposition on the part of the illustrator because we have few if any actual battle photographs from the Civil War, though quite a few of the aftermath. But the pictures definitely add to the appeal of the book. Overall, an engaging book that child readers fascinated by the Civil War are bound to enjoy, but I recommend it with reservations. Gigantic, powerful, devastating--these are the 100 most destructive natural disasters ever. 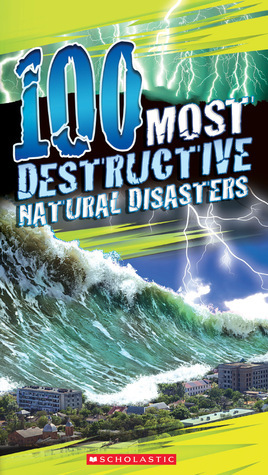 Next in the successful 100 MOST series, 100 Most Destructive Natural Disasters Ever will feature the world's most devastating hurricanes, earthquakes, and other natural disasters. This book will investigate Mother Nature's worst moments, from the 2004 Indian Ocean tsunami that killed over 200,000 people to the historic 1900 Galveston hurricane. It's everything you ever wanted to know about natural disasters and a whole lot of things you didn't. Reading this book was eye-opening. Natural disasters occur on an annual basis, some worse than others. This book highlights the worst natural disasters from recorded history. It's awe-inspiring to read about what Mother Earth is capable of unleashing. However, I wouldn't recommend this book for children who get easily scared because the photographs and information could be overwhelming. But many children will find this just as fascinating as I did. Each page covers one disaster with photographs if available, a brief explanation of the disaster, as well as any other related disasters. Volcanoes, earthquakes, hurricanes, floods, tornadoes, tsunamis, landslides, wildfires, lightning, heatwaves, sinkholes, and solar events are all covered. This is a great book for readers who are especially fond of browsing. Little bird hates rain, but loves to take baths. 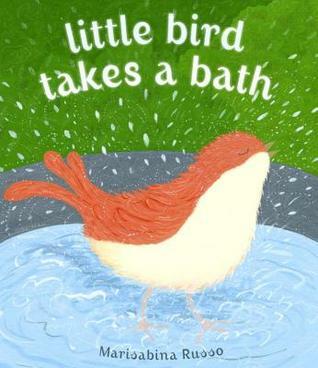 After sleeping through the night and the rain, little bird goes looking for a puddle in which to take a bath. But he struggles to find the perfect puddle. When the perfect puddle presents itself, little bird starts taking his bath only to be interrupted over and over. 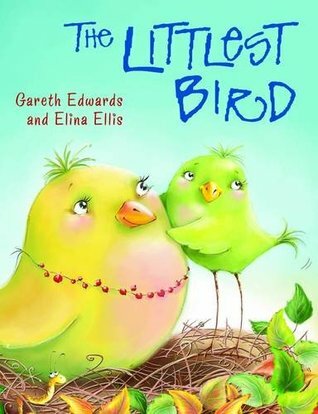 Will little bird find the perfect place to take a bath or will he have to fly home without? Russo has created an adorable story about a cute little bird. Close-ups of little bird alternate with shots of little bird flying through the city making this a great book for talking about perspective. Also, the story and illustrations are arranged perfectly for giving young readers a chance to predict what's coming, there's even some foreshadowing once little bird finds what he at first thinks is the perfect puddle. Bird comes to visit Bear to celebrate Bear's 'bearthday'. As they get ready to go on a picnic, Bear introduces Bird to his friend (the bear in the mirror). 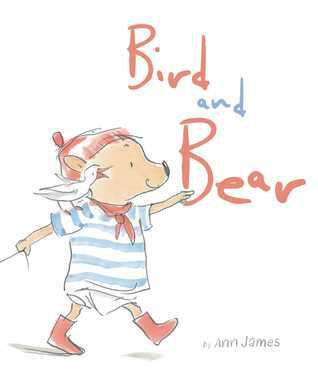 As they pull Bear's red wagon and the picnic toward the dock they see Bear's bear friend again, along with a bird. It's not until they try sharing their picnic with their new friends that they realize the nature of their new friends. But the day is still a wonderful one because it's shared with a friend. I found this a really cute story about friendship and how even the mundane can be exciting and fun when shared with a friend. The illustrations are adorable, I dare you to look at them and not smile. This is also a fun book to help toddlers and preschoolers learn about reflections. The littlest bird lives in a very crowded nest with her family. She never has room for her stuff, stretch out, and never gets enough attention from her mother. So she sets out to find a new nest. However, when she finds a new one, it appears to be empty, but she quickly learns that appearances can be deceiving and maybe home isn't so bad. 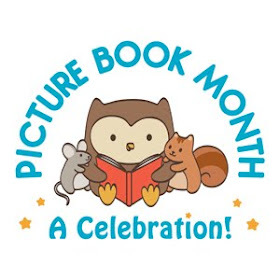 While the illustration style isn't my favorite the pictures are bright and colorful and the surprise that the littlest bird gets at the end startled a laugh out of me so I figure that young children are bound to enjoy it. The rhyming while not the best I've ever read is relatively smooth and works for the story. A cute story all around. In March 1907, the lives of three remarkable people collided at a New York City brownstone where Mary Mallon worked as a cook. They were brought together by typhoid fever, a dreaded scourge that killed tens of thousands of Americans each year. 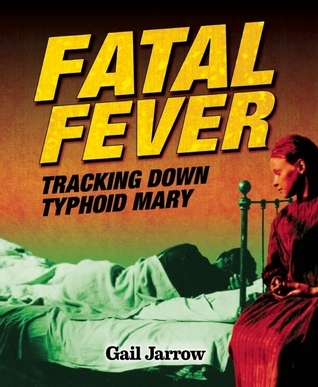 Fatal Fever: Tracking Down Typhoid Mary is the first middle-grade trade book that tells the true story of the woman who unwittingly spread deadly bacteria, the epidemiologist who discovered her trail of infection, and the health department that decided her fate. This gripping story follows this tragic disease as it shatters lives from the early twentieth century to today. It will keep readers on the edges of the seats wondering what happened to Mary and the innocent typhoid victims. With glossary, timeline, list of well-known typhoid sufferers and victims, further resource section, author’s note, and source notes. Gail Jarrow has a remarkable ability to tell a compelling story, the fact that the story is true makes it all the more interesting. I really enjoyed her previous book, Red Madness, so I was really looking forward to reading this one. I loved this one as well. This book is everything that narrative nonfiction should be, a compelling story, interesting characters, and a challenging problem. Disease has long been a source of great suffering and difficulty and it still is throughout the world. Reading a story like this helps reveal the many who have helped fight the battle against disease, some by choice, and others like Mary Mellon, very unwillingly. Mary's story is a sad one as she was as much a victim as those she infected, at least until she deliberately chose to ignore the warnings she received when she was released. She had the unfortunate honor of being the first healthy typhoid character identified in the United States. As such, public health officials weren't really sure what to do with her, so they locked her up. She wasn't treated particularly fairly considering the problem wasn't her fault. But her refusal to accept her status as a carrier made things even worse. The challenge of protecting the public's health versus individual rights is one that continues to be fought to this day. This book is both a fascinating individual story but also a story of the fight against a disease and the people who waged that fight. I can recommend this book to those like myself who find such stories fascinating both the historical aspects as well as the science. Scientists in the Field is a series that I absolutely adore. I have yet to read one that I didn't thoroughly enjoy. I learn a lot and the photographs are fabulous. The Octopus Scientists is no different. 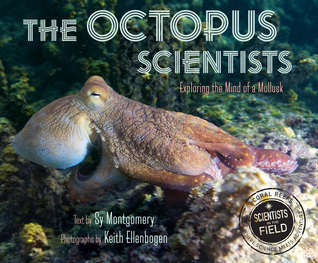 The story of the four scientists along with the author and photographer's journey to a Pacific island to study octopuses and their personalities and feeding habits drew me in from the get go (especially the photographs of the beautiful island). The author also includes several sidebars with extra information about the scientists as well as octopuses in general. I was fascinated to learn that what I've always thought of as the octupus 'head' is really more of a torso. The author's experiences meeting individual Giant Pacific octupuses at an aquarium showed clearly that octopuses really do have their own personalities. For budding scientists or young readers fascinated by the natural world will find this a compelling look at the realities and excitement of field work. From the invention of needles made from woolly mammoth tusks in 10,000 B.C., to the evolution of armor from chain mail to modern-day bulletproof vests, to the controversy surrounding contemporary outsourcing, Albee looks at history through the lens of fashion as a way to engage young readers. Each chapter focuses on a major period of world history, from the Neolithic era to the present day, and explores the evolution of fashion as a reflection of the politics, class hierarchies, religion and economics of the time. This highly visual collection is full of colorful sidebars that answer questions that are not usually addressed in the classroom: How did people keep their clothes on before zippers or buttons were invented? How did soldiers go to the bathroom when wearing their heavy armor? Pictures, painting and artifacts further illustrate the concepts discussed in each chapter, while funny anecdotes and a focus on cultures of interest, such as the Vikings, will keep even the most reluctant readers hooked. Snappy headlines, a stylish layout and a foreword by "Project Runway" fan favorite Timm Gunn make this extensive and entertaining guide perfect for both in-depth study and casual browsing. Why'd They Wear That? is ideal for fashionistas, theater aficionados and history buffs of all ages. The New York Times best-selling author Sarah Albee has written more than 100 books for kids, ranging from preschool through middle grade. She enjoys writing about topics where history and science connect including Bugged: How Insects Changed History and Poop Happened: A History of the World from the Bottom Up. When she isn't writing books or visiting schools in person or via Skype, Albee enjoys blogging about offbeat history and contributing to the Interesting Nonfiction for Kids 'Nonfiction Minute'. The minute I heard about this book I was intrigued. History I've always enjoyed reading, but I've never looked at it through the lens of fashion. I was not disappointed in the least. 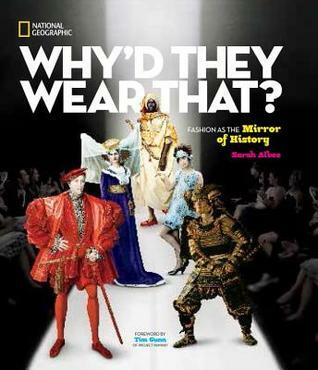 The book fascinated me with it's look at the fashion choices people have made over time and how those choices were made in the context of the time. It was interesting to know that people's impractical and often painful fashion choices haven't really improved much over the years. The book is divided up by time period with particular fashions from each period highlighted, everything from suits of armor to corsets to bound feet to ruff collars. The author includes side notes about various jobs related to fashion none of which sound particularly enjoyable. It was eye-opening to ponder why people dress the way they do both past and present. While some current fashions seem practical and comfortable, there are just as many uncomfortable even painful fashions that still exist (stiletto heels, anyone?). For readers who enjoy reading about fashion or history I highly recommend this wonderfully fascinating book. What lead you to write about this topic? I love to choose a theme that I think is interesting (and that kids will, too) and trace it chronologically through history. I've always been fascinated by fashion and it's such a naturally compelling topic because it is so visual, and has been so thoroughly chronicled by artists and, later, photographers. And it really is a mirror of history. What's something you learned that didn't make it into the book? Oh, so many things! The book could have been three times the length, and it was difficult deciding what to cut and what to keep. I wish we'd had more room to show the evolution of women's athletic wear. There are some amazing photos of female mountain climbers in the late 19th/early 20th century, clambering up mountains in long skirts and corsets. What's your favorite part about writing nonfiction? least favorite? It's a really exciting time for nonfiction right now. I love that I can delve into a topic I'm passionate about, and that editors are interested in what I want to write! And more than ever before, we nonfiction writers can use our own voice and write with humor/persuasion/passion. So different from the past when nonfiction voices were expected to be more.. .dispassionate. My least favorite part of being a nonfiction writer? That's a tough one. I do wish I saw more nonfiction on kid bestseller lists. But pssst! The Revolution is coming!! I'm a big opera fan. Don't laugh. My husband and kids all love most music, but let's just say they're not opera fans. From time to time I go to the opera by myself, and it brings me huge joy. I love clothes, but as a kid's book writer married to a teacher, I can hardly afford high fashion. But I do love shoes! After writing this book, I have definitely changed my buying habits, though. I try to buy way fewer clothes, and before I do buy something I really look at what it's made of, where it was made, and by whom. I try to buy from clothing manufacturers who treat their workers ethically, and sometimes that means the clothing is more expensive. But for those of us who have a choice, I think it's important to understand that cheap clothing comes at a high cost--to the economy, the environment, and to the people who work in the garment industry. Much of the book is about the people who tanned the leather, wove the cloth, dyed the textiles, and picked the cotton. I wanted it to be their story as well as the story of the people who wore these crazy clothes.